~merry merry my lovely dreamers… welcome to the realm of The beansidhe alchemist, where I invite you to engage in our creative technique, The Art of Dream Alchemy. I developed this technique because of the significant archetypal forms and mythological images that came forth from the dream soul, one in particular entitled, Essex. He is a messenger of the ancient ones… the ancestors, and the first dream figure, who revealed the paradoxical and wondrous nature of psyche, that is, its underworld is filled with magic, beauty, brutality, sorrow, and grief, but most importantly, it is the imaginal realm of soul. Essex is the mythopoetic tale, reflected in a lighthouse by the sea. He is the lyrical song, evoking a mythical cadence of the personal psyche, imaging the mythical timbres that dwell within the collective unconscious. Essex is a gift from the archetypes, the living dispositions, and the gods. He is an offering, revealing the multidimensional aspects of psyche, suggesting, there are many elements that move through an alchemical process, engendering a creative form. In this case, the paradoxical elements and figures within the dream image are an extraordinary, otherworldly source, which allows us to create the mythical tale, mythical art, mythical music, and inspire mythic somatic movements. I invite you to explore our Dream page for a list of our courses, or move into our Alchemy page, where you will find the mythical tale of Essex. Moving into a deeper level of the underworld of The beansidhe alchemist, you will find our Blog, whereby, The Art of Dream Alchemy takes on its mythical form. Our Media page is the resting place for the creative work of our guest Dream Alchemists, who are winners of our yearly scholarship contest. I encourage you to enter and explore the realm of The beansidhe alchemist so that you too may discover the dream image is beckoning you to remember that you are a reflection of psyche… you are imagination. The Bean Sidhe (banshee) is a woman fairie, or woman of the hill. These beings are from an invisible world, living in Sidhe mounds. The Sidhe or Tuatha De Danann, were a tribe of people from Irish mythological ancient times that inhabited the hills of Ireland. I believe they still exist today in another realm or behind, what I would call a webbed veil. We are always crossing realms in our dreams. I call this the sacred shadow realm of our sleep. The two symbols on the logo are significant of two trees from the Ogham language: duir and uilleand. Duir is an oak tree, symbolizing the doorway into the realms of the world and our psyche. Uilleand is a honeysuckle shrub, symbolizing the hidden secrets of our soul, and the labyrinth we travel along to discover the secrets and truth of our spirit. We are looking for four Board of Directors. If you are interested in being a part of a growing nonprofit organization, send us your bio and contact information. Even though we are based in California, we are seeking individuals locally, as well as globally, but you will need to communicate with us via email, Skype and phone. You can find dates and information for our online, The Art of Dream Alchemy class on the Dream page. We will have a fundraiser in the fall. Sign up on our mailing list to stay connected. We would love to facilitate a workshop in your area. Please contact us if you are interested learning our technique, The Art of Dream Alchemy. "When my father was diagnosed with terminal cancer, Gina worked with me in combining creative writing and my dreams to move toward healing my unconscious grief and preparing myself for the impending challenge of realizing my identity without a living father. 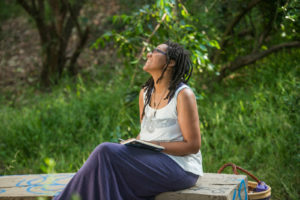 Through targeted assignments she developed from symbols in my dreams and her focused feedback on my writings, I have been able to channel inner strength in what has been my most painful life challenge." "By introducing aromatic oils, music, dance, and organic raw foods, Ms. Rochell relaxes the student's mind for the creative writing process. This process has an artistic value when the unconscious faculty, in this case it is the dream realm, provides raw material for the conscious faculty to develop character and setting in the creative writer's fiction. These audible, kinesthetic, and aromatic senses are healing agents: they help the student first to write the dream, and then to give voice and interpretation to the images in the dream. This second step, embellishment, is not only a process of creative writing, but it arises from a sense of freedom from tension."